TrueRTA's audio spectrum analyzer software shows you a detailed picture of what you're hearing in real-time, that is, as it happens. 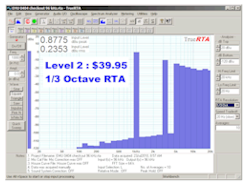 You can create your own professional measurement system starting with TrueRTA software on your PC. Then add the measurement microphone, preamp and USB interface of your choice. TrueRTA accurately tests audio systems using a Windows PC with basic sound capability. TrueRTA turns your PC into a powerful audio test system normally seen only in better audio research and design laboratories. TrueRTA runs under Windows Vista, 7, 8 and 10. Observe the frequency characteristics of live music in real time. Combine individual loudspeaker measurements into a spatial average frequency response measurement. Observe the frequency characteristics of recorded music or other recorded audio. Use as a voice and music learning aid. Study the harmonic structure of musical instruments. The screen shot below shows TrueRTA evaluating the performance of the E-MU 0404 USB sound system with a 1kHz sine wave where the 1 kHz distortion components are seen to be below -100 dB (i.e., less than 0.001%). TrueRTA's audio spectrum analyzer software shows you a detailed picture of what you're hearing in real-time, that is, as it happens. The audio spectrum analyzer shows the changing spectrum of live input signals up to 48kHz (half the maximum sampling frequency). The size of the waveform sample is variable so that shorter samples can be used where a high frame rate is required, as in sampling live music. Longer samples provide increased low frequency resolution with the tradeoff of slower updates. The latter settings are appropriate for highly accurate frequency response measurements. Some of the above applications require the use of the analyzer in combination with a test signal from the generator. Others (such as noise analysis or analyzing live or recorded music) require no test signal. 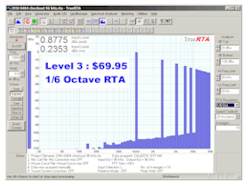 TrueRTA's Quick Sweep employs a short digitally generated sweep (chirp) to measure the frequency response of electronic and acoustical systems. Below is the measured response of an E-MU 0404 USB audio interface at 96 kHz sampling frequency. Below is TrueRTA with Sound System Calibration switched on. Note that the response of the sound card has been removed from the measurement so that a self test of the sound card now shows a flat response. The response of any system you now insert in the test loop can now be measured very precisely plus or minus .05 dB. Below is a Quick Sweep measurement of a high pass filter created by inserting a 470 pF capacitor in the test loop. When loaded by the input impedance of the sound card the series capacitor forms a high pass filter with -3 dB frequency at around 300 Hz. Note the total absence of any sound card response error. Only the response of the actual filter is measured when sound card correction is employed. TrueRTA's Signal Generator produces an ultra low-distortion sine wave variable from 5 Hz to 24kHz. The output level can be specified anywhere from full scale to a single bit of amplitude. In addition to the sine wave the generator can be switched to pink noise. The higher level versions of the product can also provide a digitally created logarithmic sine sweep from 10 Hz to 48 kHz. This signal is a high-resolution alternative to using pink noise for system testing. The swept sine wave provides a higher signal level at each frequency compared to pink noise and lacks the peaks and valleys seen in pink noise response plots. The digital Quick Sweep is an excellent alternative to stepped sine wave frequency response testing. Here is a screen showing the oscilloscope in dual trace mode and displaying a 1 kHz sine wave. TrueRTA in dual trace Oscilloscope mode displaying a 1 kHz sine wave. TrueRTA's Oscilloscope allows you to view the input signal waveform. Trace can be frozen at any time by pressing the space bar. The frozen trace can be scrolled using Alt+Left/Right. Selected functions are displayed in the same window as the oscilloscope or spectrum analyzer display. 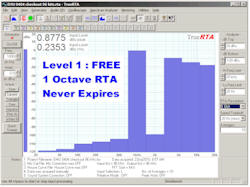 First, download the FREE TrueRTA Level 1 sound analyzer and try it out. You will likely want to upgrade to a higher level with increased resolution. Select the level you want and submit the order. We will email you a Registration Code. After you receive the code, launch the Free Level 1 and look under the Help menu. Select User Registration. Enter the code in the appropriate level field. Upon successful entry of the code you will have an immediate upgrade to the level you ordered. Menu items will be activated, providing greater power. There is no need to download the file again. Level 1 NEVER EXPIRES! Vista and Windows 7/8 Compatible! What Our Customers Say About TrueRTA! 'Not sure I need the 1/3 octave BUT I have used the free version so much I feel compelled to pay you for your efforts. This is a great program and an indispensible tool for managing feedback at live events. 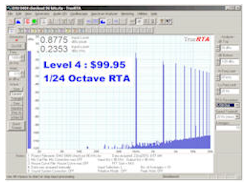 "While lots of audio measurement software applications exist for the PC, the one that seems to have captured the hearts of engineers and enthusiasts is TrueRTA, available at trueaudio.com. Most speaker engineers I know keep a copy on their computers." - Brent Butterworth, Sound and Vision Magazine, Jan 2011. Read the entire article here.